Take a tour with real estate drone video of the most insane luxury mansions across the United States. 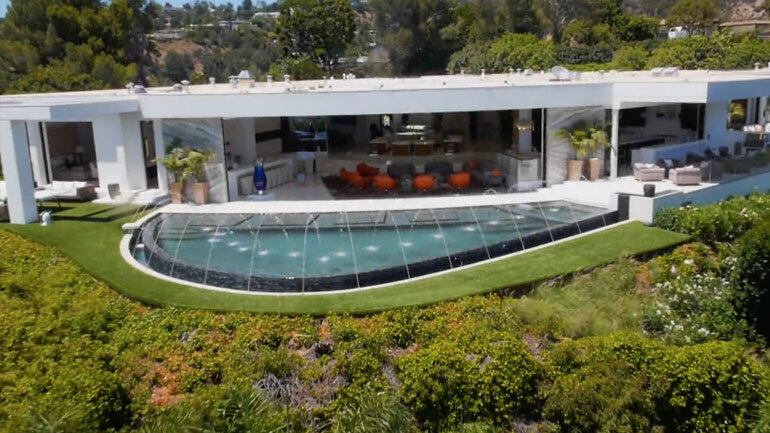 Kicking off this real estate drone video list is the luxury mansion for sale by Markus Persson, the founder of hit game Minecraft, located in Beverly Hills, Los Angeles. As you watch this incredible real estate drone video footage, you’ll notice some of the most expensive luxury mansion perks – infinity pool, full bar, models and all the candy you could ever imagine! Los Angeles is home to some of the most incredible mansions in the United States. Guess how much this sold for? $70,000,000! That easily makes it one of the most expensive luxury mansions in the United States. Make sure you watch the entire video to see the movie theater, the fountains for the infinity pool, the all you can eat candy area (best), the vintage Jaguar convertible, workout room, outdoor lounge and outdoor spa. Wow. I’ll take the guest room. Please. Another example of amazing real estate drone video footage is from Beverly Hills, California in our roundup of the most expensive luxury mansions in the United States. At first this place looks pretty modest…until you see the real estate drone footage. The lighting is SICK. Stainless steel doors are a nice touch. There is plenty of modern design that provides a sleek and striking look to the entire house. Modular design like this is very popular with luxury mansions. The Japanese garden on the second floor is also quite nice. When you see the drone soar over the roof, you’ll notice the pool and lounge area. Every room seemingly has a fireplace. Bathrooms have those cool waterfall style flow. What am I doing with my life? Nighttime is where the real magic happens. Imagine sitting outside with a fire pit watching an LA sunset? Amazing. We move to Bel Air, California to find our next powerhouse estate for our list of the most expensive luxury mansions. This place is HUGE. It’s obvious that it requires a real estate drone video to capture everything. This was built by an architect named Paul Williams (apparently he’s famous) who decided to put in a 3,000 square foot master bedroom and 17 bathrooms in this place. You’ll also find 7 fireplaces, a movie theater, sauna and complete outdoor lounge/living area. Oh – and you were concerned about entertaining guests, you’re all set. They added an ENTIRE BALLROOM to the back of the house to make sure you can throw the most Gatsby of all parties. Did you see the pool? And hot tub? Or the cabanas? Southern California is doing well with their luxury mansions. The Stone Mansion is super nice…and one of the most expensive luxury mansions money can buy. As you watch the Ferrari pull into the cobblestone garage and courtyard, you’ll get exclusive access to some amazing drone footage. There are over 10 bedrooms in this mansion just waiting for a huge party. This real estate drone video really captures what the house is all about. Imagine the cocktail hour? The outside grounds are also immaculate. Swimming pool? Check. Tennis court? Check. Inside you’ll find a wine cellar, chandeliers, and stone countertops everywhere you look, giving this colonial style mansion an old school but modern feel. The white room with the hot tub looks tempting but the indoor basketball court is definitely where it’s at. I could use that desk for some Facebook checking. The Arden House is located in update New York (Harriman) on an enormous plot of property. This helicopter/drone footage of the luxury mansion is spectacular, especially with the amount of surrounding land. You’ll notice that this place is very old school with it’s stone architecture and gothic designs. Maybe it’s a castle? Maybe you’re Harry Potter. Maybe. Hard to imagine not having an amazing time while enjoying your hundreds of acres and sipping champagne. Greystone Mansion (and Park) are ALSO located in Beverly Hills, California, adding to this crazy list of the most expensive luxury mansions in the United States. It’s kind of baffling actually that a property like this exists so close to a city like LA. Make sure you watch to see the goldfish (huge) in the private fountain in the courtyard. I am almost positive I would get completely lost in here if given a few hours to roam around. There are strong balconies and 20 foot ceilings. Marble floors and mahogany stairwells also add to the luxury of this property. You can see why this place has so much history and charm. It’s been around since the early part of the century and has been used in movie sets and production! There are 55 rooms that you can live in at Greystone and almost 50,000 square feet of property. It cost $3M to build in 1927 which is about $39,000,000 in 2015 dollars. Across to the opposite coast finds us at a beachfront luxury mansion near Palm Springs, Florida. This house is ON the beach! Wow. Sit on your chaise lounge and listen to the waves from the front deck of your mansion. Oh yeah – this place was on the market for $35,000,000.